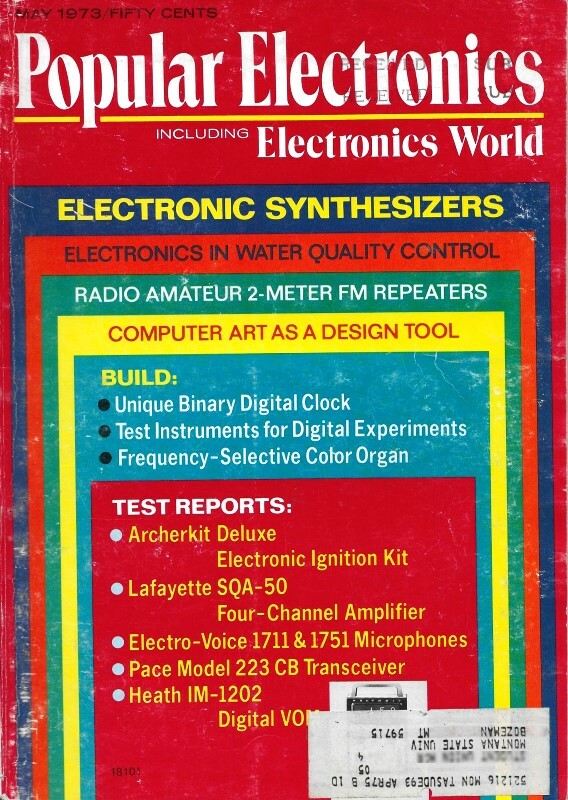 It is hard to imagine a time when integrated circuit (IC) comparators were a big deal, but as recently as 1973 when this article appeared in Popular Electronics, they were new to a designer's bag of tricks. Prior to an IC solution, comparators needed to be constructed from opamps and a handful of peripheral biasing components. As with other integrated circuits, not only does the overall price go down, but so does circuit board real estate, cost, temperature variability, and electrical parameter variance between devices. The first comparator circuit I remember designing was a temperature sensor that went in an oven used for curing the potting material on prototype hybrid circuits our lab was building with wire-bonded bare die and RLC's. It used the LM339 (leaded DIP) mentioned in this article to trigger a timer circuit for beginning a controlled cool-down profile needed to prevent the epoxy from ripping bonds off as it shrank. I was still a technician at the time, and thought it was a heap big deal that it actually worked. Our Solid-State Scene this month focuses on two key developments in the IC world - new types of quad comparators and op amps. Although these classes of devices serve different functions, they are in a sense related because both are members of the linear IC family and they operate by differential comparison. Further, they use some similar circuitry and are designed for building-block use in systems with single power supplies. Chances are that, once you become acquainted with these two new devices and what they can do, you'll find them useful additions to your bag of tricks. New Quad Comparators. 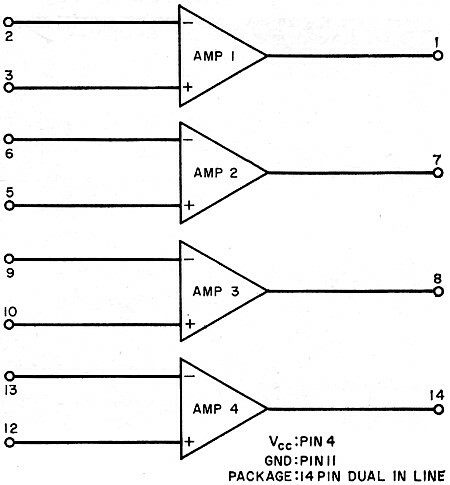 The op amp is probably familiar to most of us, but the comparator may be new to some. 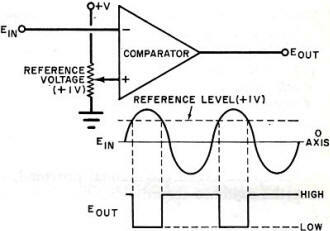 A comparator is simply a high-gain amplifier designed to compare two inputs. Like the op amp, a comparator has differential inputs, both inverting (-) and noninverting (+) with respect to a single output. Beyond this, however, the devices differ. A comparator is not used with negative feedback, whereas the op amp usually is. 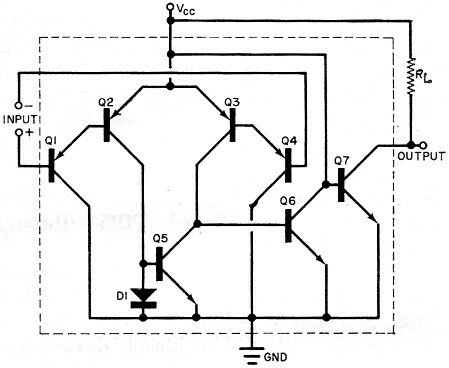 In a typical application for a comparator, a fixed (reference) voltage is applied to one input and a varying voltage (either ac or dc) to the other input. The output will then change states as the varying input voltage crosses the fixed reference level. The device answers the logic question, "Is the input greater or less than the reference?" The relative states of the inputs are then indicated by the output - either high or low. Fig. 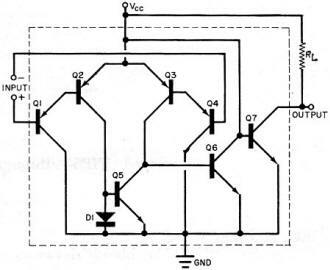 1 - Basic action of a comparator. Fig. 2 - One section of a quad comparator. In the example shown in Fig. 1, a fixed 1-volt dc level is applied to the (+) input while a sine wave is applied to the (-) input. When Ein is less than +1 V, the output is high. As Ein rises and passes +1 V, the output switches states, going from high to low. Typically, a comparator is capable of a wide range of input levels (allowing it to be used with a wide range of input voltages) and its output is compatible with one or more forms of logic. Applications for comparators include level detectors (such as Fig. 1), sine/square-wave converters, phase detectors, oscillators, multi-vibrators, and a host of other switching circuits based on the level-detection principle. Multiplying a useful basic idea by four, Motorola and National Semiconductor have recently introduced quad comparators in single 14-pin packages. Motorola's chip is the MC3302P, while National has a series composed of LM139, LM239, and LM339 (the main difference among the three being temperature range). What is unique about these devices as compared to previous ones? Well, they operate from ingle or dual power supplies over a wide range. They also have a very low power drain and their outputs can be used with all forms of logic. A very unusual feature is the pnp input stage (Fig. 2) which allows the input to be biased at ground level - even with a single power supply and no additional bias. Outputs of the comparators are open-collector npn stages - a handy feature for connecting a number of devices in parallel for combined logic functions. All devices mentioned are available in 14-pin packages. Quad Op Amps. We have mentioned a family relationship between the new comparators and op amps. National's new LM124, LM224, LM324, and LM2902 are the op amp relatives. They also feature that neat pnp input stage which allows such a wide range of input voltages. These devices are also designed for a single power supply (or a dual supply) and have low bias current. These chips are in many respects like the popular 741, and for many applications, may be used as such. For instance their gain is about 100 dB; bandwidth is 1 MHz; and the amplifiers are internally compensated. All of these factors simplify their use considerably. Pin arrangement on these devices is different from the previously announced quad op amp (LM3900) and is shown in Fig. 3. This is a symmetrical layout with outputs at the four corners of the 14-pin package. The power supply pins are used as a screen between the two amplifier sets. Fig. 3 - Pin connections for op amps. 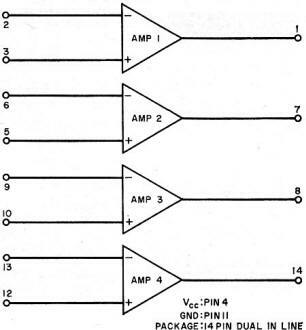 It has been said that the op amp is the most universal circuit component in existence. Now, universality acquires a new dimension - four universal components. Single-unit prices for the commercial grade comparators and op amps are: MC3302P, $1.20; LM339N, $5.70; LM324N, $3.75. Programmable Comparator. RCA has just introduced an interesting new IC: the CA3099E programmable comparator with memory. This chip is a combination of high- and low-voltage level sensors, a flip-flop (for memory), a driver, and a 150-mA output stage. It is capable of performing a variety of functions and has built-in voltage and current regulation. The device can be externally programmed for adjustment of performance and is designed as a control element for high-current loads such as thyristors, relays, lamps, etc. Applications include heater controllers, photosensitive relays, motor controllers, level detectors, time delays and one shots, and over-voltage, over-current and/or over-temperature protection. The device comes in a 14-pin dual in-line package. Optic Couplers with 4N Classification. Have you ever been confused by the proliferation of numbers for LED (light-emitting diode) phototransistor electrooptic couplers? Motorola has recently taken a big step toward standardization of these devices by registration of former device numbers MOC1000, MOC1001, MOC1002, and MOC1003. The newly numbered devices are the 4N2S, 4N26, 4N27, and 4N28. Isolation voltage ratings range from 500 V (min) with the 4N28 to 2.5 kV (min) with the 4N25. Types 4N25 and 4N26 feature a 5-mA output current while the 4N27 and 4N28 achieve 3 mA, both ratings with a 10-mA input. All units are in 6-lead dual in-line packages with prices beginning at $1.50 for the 4N28. Power Transistors. Quite a number of new power transistors have been recently introduced by Texas Instruments. The devices cover a variety of packages and voltage ratings, both single transistor and power Darlington, in high voltage and complementary form. The TIP620, TIP621, and TIP622 are npn power Darlingtons with voltage ratings of 60, 80, and 100 V respectively. The pnp complements are TIP625, TIP626, and TIP627. All units can dissipate 100 watts, have a gain of 1000 at 3 A, and come in TO-3 metal packages. For higher voltage applications, there are the plastic-packaged TIP55 through TIP58 (250, 300, 350, and 400 V), while the TIP554, TIP555, and TIP556 come in TO-3 metal packages with ratings of 200, 300, and 400 V. All units have a 125-watt dissipation rating. The plastic devices can handle 7.5 A, maximum, while the metal versions are rated at 5 A. Nine high-voltage Darlington devices have also been introduced. The TIP150, 151, and 152 are in TO-66 plastic packages, rated at 2 A and 200, 300, and 400 V, respectively. The TIP160-162 come in TO-3 plastic packages, while the TIP660-662 come in TO-3 metal packages. Current ratings for these two sets are 5 A at 200, 300, and 400 V. The TIP150-152 have gains of 500 at 1.5 A, while the remaining units have the same gain at 3 A. Power ratings for the three different packages are 50, 125, and 150 watts.